The power went out yesterday at 4:30 PM. I was home alone. Mark was in town with the car. It was strange to watch out the windows as the sky grew darker and darker. Finally, the sky lit up with lightning. The thunder was so loud it shook our apartment building. When I lived in Lake Tahoe my mom had given me a wind up radio. For some reason, that radio was one of the few things I shipped over to Hawaii. 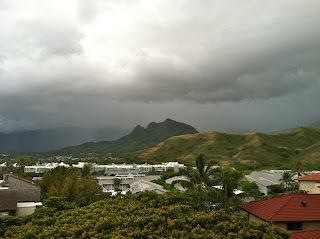 I wound up the radio and heard that most of Oahu was without power due to lightning hitting transformers. After informing us of the traffic problems, road closures, water spouts, power outages, and flooding, the DJ called it a “Kabajang Monday”. Then he said, “For those of you new to the islands, kabajang is what we call “crazy”. 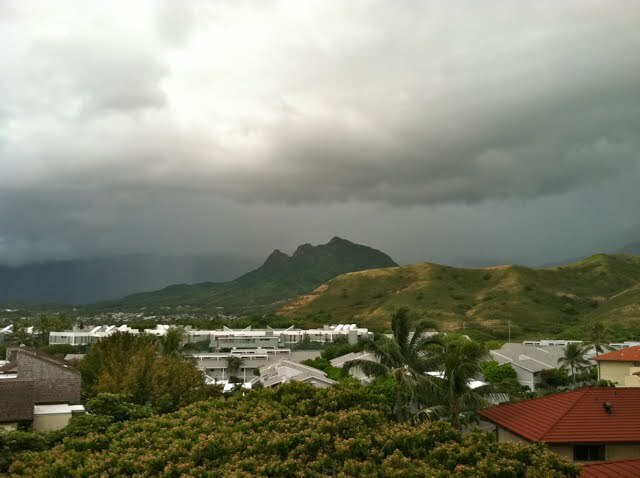 Mark texted me a photo of two waterspouts off the coast from Honolulu Airport. They delayed all flights in and out of the airport. Locals say they’ve never seen a storm like this in Hawaii. 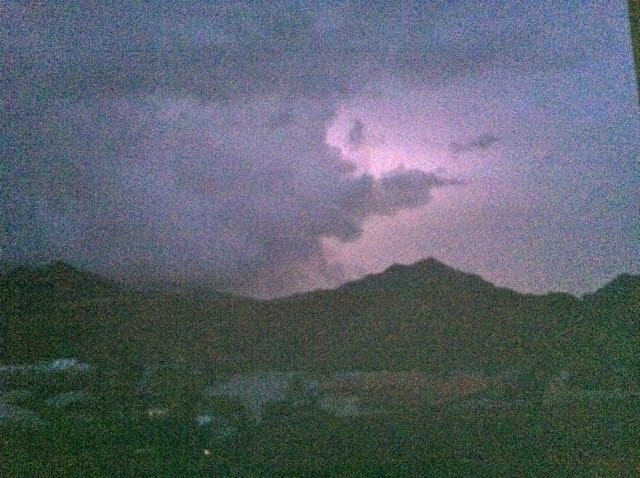 The pink in the sky in the photo is the lightning flashing behind the clouds on the other side of the mountains. At this moment, the wind is howling and it’s pouring rain. Better get this posted before we lose power again. Next Next post: Where Are The Brussel Sprouts?